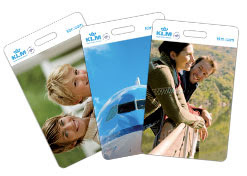 KLM, Royal Dutch Airlines, is offering up a FREE Design your Own Luggage Tags! There is no charge - not even shipping! Order one for yourself or for a gift and have it directly sent to whoever you choose. You can upload a photo of yourself, your family, or a favorite vacation destination. Or you can choose from one of the pre-selected images. Thanks, Hip 2 Save for the scoop on this great deal!